(PhysOrg.com) -- A Swedish company headquartered in Stockholm has figured out how to power smartphones using a system that includes some water, a tray, a little round container, and an eyeglass case styled cover. The company, myFC, is introducing its PowerTrekk system to Americans at the CES show in Vegas. PowerTrekk describes its charger as a pocket size, lightweight gizmo for users who spend time away from the electricity grid. Translation: If you are hiking over the weekend with no Starbucks or friends flat in sight, your phone can still get charged. 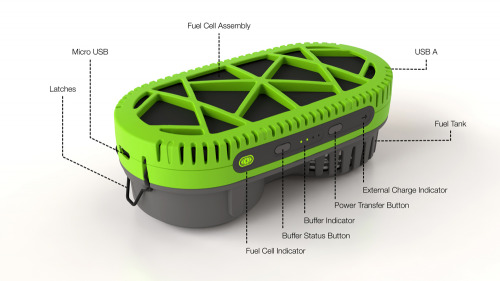 The PowerTrekk portable, water-powered fuel-cell charger was first introduced last year at Mobile World Congress in Barcelona and is now being eyed at CES. The setting up process is quick and easy: pour water in the tray, place little round container in tray, cover, connect with your USB and you are on your way. The system works with all devices powered by USB. The hockey puck like container called the Powerpukk has sodium silicide which produces hydrogen gas when combined with water. Then there is a tray with a little opening where you pour in water, about a tablespoon. Sodium silicide is a specially developed chemical from SiGNa Chemistry. When mixed with water to release hydrogen gas, it is a key element of this system. The New York-based company rep at the CES show performed the demo. Sodium silicide (NaSi), according to the company, is a nontoxic powder that produces hydrogen (H2)on-demand from its reaction with any type of water, including salt water, and is packaged in a cartridge for use with fuel cells rated from 1 W to 3 kW. PowerTrekk is the first brand to use SiGNas mobile-H2 product. As for the water, there is no need to worry about whether you should pour from your cache of Evian or Desani, either. Since this was designed for trekkers in realtime, any dirty water from a stream or puddle will do, provided there is no undue sediment. 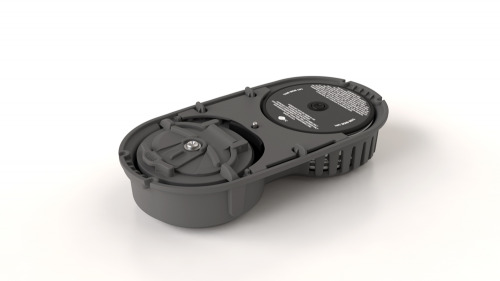 myFC says the PowerPukks are made of materials that prevent corrosion and leakage. This brick-size cell phone charger produces about the same amount of power as four AA batteries and delivers about 10 hours of phone battery life, according to reports. The system is expected to be in stores by May or June. Guesstimates of pricing have been varied, ranging from early reports of between $200 and $250 to more recent guesstimates that it may be listing for around $299 with replacement containers priced at about $4. Question: If you're hiking in areas that are so out of the way that you have no way to access a grid for the duration battery charge in your phone: Doesn't that mean that you are so far in the sticks that it's unlikely that you'll have cell phone coverage at all? So what's the point? Why would you be lugging around your cell phone on such a hike in the first place? I'm unclear on the amount of power the PowerPukk actually delivers, even after visiting the website. From what I've read, I am left wondering if I would simply take along 4 new AA batteries in place of each PowerPukk anyway and it looks like it would be less bulky and much cheaper? Also there are plenty of wind up torches, lanterns, radios and phone chargers that will never stop working so long as you have arm to crank the handle. Nancy, you might want to include how many joules it can squeeze out. Guesstimates of pricing have been varied, ranging from early reports of between $200 and $250 to more recent guesstimates that it may be listing for around $299 with replacement containers priced at about $4. Eww you said guesstimates. Not just that but you said it more than once in the same sentence. As @Jimbaloid said, why not to simply use the four AA batteries instead, after then? They're as heavy as the whole charger, much cheaper and still occupy a much smaller space in the baggage. Well it's a cute idea but why not just carry a battery? 1) how much current do you get over time. 2) it's said that you get 10 hours of use. Is that it only works for 10 hours after activation or is that 10 hours of continuous use. 3) how much current will it deliver. it can run an iphone but can it charge an ipad.. most USB power devices can't. As for using your phones gps.. if you don't have cellular coverage you don't have access to the map data. Yeah, I'm gonna agree. It's not too hard to cary an extra battery or two for your phone. The chemical cartridge system would be a one-time use item, and once you drop it in the water there's no stopping it till it is expended. I guess the device might store the hydrogen, but it doesn't look like that's what it does. Really, my emergency radio has a USB port on it and a hand-crank and a solar panel. It's slightly larger, but also has a LED reading light, an emergency flasher and a multi-band radio. Why have your cellphone, out-of-area? Because a helicopter trying to find you could pick up the signal. Some cellphones go into a beacon mode if they haven't moved for 24 hours. 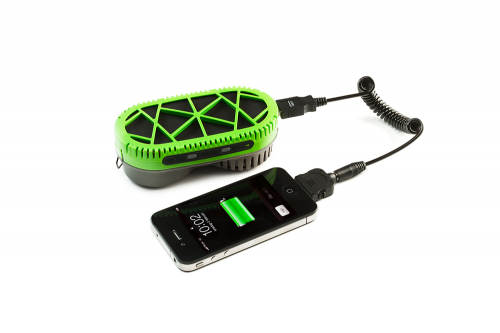 The solution is a multipurpos solar cell charging device that can charge phones, its out there to buy. The first comment said exactly what I was minded to say when I read the brief in the daily e-newsletter. Then I thought if your out in the wilds use a map. Its so much cheaper and more reliable. If you need to attract attention then send your travelling partner for help. What do you mean your travelling solo? Are you all mad? Then I got the rest of the comments tripping my thoughts up and suddenly it occurred to me that the only reason that this device is being promoted and priced at this level is to get the funding to develop it further........and make loads of money aka Apple Corp iPhone/pad/pod Mk 1/11/111/1V/V etc. Don't you just love profitable marketing.